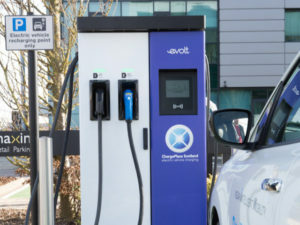 EVolt has installed the first chargers along the M8, enabling drivers to recharge between Glasgow and Edinburgh. Located near J7 at the Maxim Office Park, the new chargers comprise two Raption 50kW rapid chargers and two eVolve 7kW chargers. The rapid chargers are capable of charging two vehicles simultaneously at full power in approximately 30 minutes. According to eVolt UK general manager Justin Meyer, the uptake of pure electric vehicles is growing twice as fast in Scotland as anywhere else in the UK. The new units join the ChargePlace Scotland network, which now has over 700 live charging units, and will also be used by Maxim to encourage on-site staff and visitors to consider electric vehicles. The office park will be one of only three locations in Scotland to host the top-end EV chargers.